Show Your Humanity is a puzzle in Dark Souls 3: The Ringed City. It is located on in the Ringed City by the Ringed City Streets Bonfire. To solve this puzzle, travel to the swamp area, and use a White Branch twice or the Chameleon spell while standing in the water. You will be transformed into a humanity, much like Dark Souls One. While still in humanity form, walk back to the wall with the inscription and it will open a path to a ladder and secret items. Dragonhead Shield - Found after the "Show Your Humanity" Puzzle. See Video above. Covetous Gold Serpent Ring +3 - Found where Lapp's 3rd location. All the way down the stairs from the Shira and and left and up the ladder immediately on your left in the swamp. Double back across the bridge, defeating the two Ringed Knights. On a corpse in a room past them with Lapp inside. Havel's Ring +3 - Found just below where you get invaded by Dark Spirit Ledo, on the ledges above the swamp. 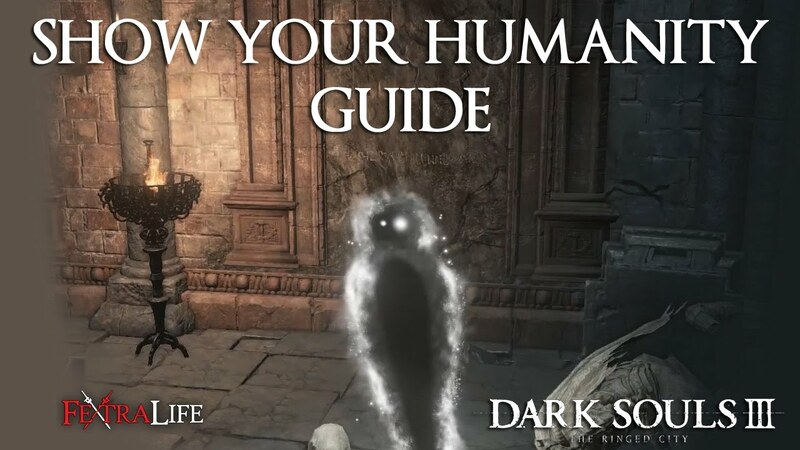 I played other souls games, but I would never figure this one out by myself, I only could think "show your humanity" as not being hollowed. Forgot to mention two of those knights, and one of those freaking giants who summon tons of archers and Black Knights btw. Why can&apos;t members update these pages? Could use a better discription of the location. Maybe even a picture. FYI: The wall inscription is in the room next to the Ringed City Streets bonfire room. The room has two Ringed Knight statues against a wall and the inscription can be found on the same wall just to the right of these statues. Can&apos;t edit the page and I know people will likely navigate to here without going via the walkthrough page so hopefully this comment remains visible enough to help. No need to use it twice. You randomly turn into something. If you are the black shadow with the white eyes, you turned into the correct thing. Beware, if you sprint, you turn back to yourself, so just walk there. 1. No need to use "White Branch", you can use "Chameleon" spell as well. 2. Its NOT located "on in the Ringed City by the Ringed City Streets Bonfire" it is located in the room NEXT TO "Ringed City Streets Bonfire" room, the corner directly to the right. I don&apos;t understand the rationale behind the "official" Fextralife videos. Why did you run all the way across the swamp when you can just use a branch at the bottom of the stairs? If you&apos;re going to show climbing the ladder and going to the purging monument, why leave out that you have to simultaneously fight two ringed knights and a summoning giant on the way? Why leave in a minute of pointlessly running across the swamp but jump cut between the bonfire and the inscription location? It&apos;s a 3 minute video with 2:30 worth of misinformation. I dont have the option for kings decree why? So appart from having the inscription in the wall, there&apos;s two hints to the solution. Like someone said before, the young white branches found earlier in the level. But also if you use the Seek Guidance miracle, you can see a dev message in front of one of the chairs in the "show your humanity" room, which says "If only I had a mimicry". Funny how everyone bashes that miracle on its page for being useless. I don&apos;t know if it&apos;s the water what makes you turn into the humanity form, I did it experimenting with Chameleon near one of the Abyss crystals and on the first try I got morphed into it, I guess it&apos;s the relation between the abyss and those enemies from DaS. Took me three days to figure it out, on three sessions of an hour or so and lots of thinking off the game. Totally worth it. When I use the white branch I turn into a different form (not the dark ghost looking thing) but more like a statue and the ladder will not drop. Any idea what I am doing wrong? The Covetous Gold Serpent Ring +3 and Havels Ring +3 shouldnt be listed here, they have nothing to do with this location. And usage of the White Branch is random, you dont have to use it more than once if you get the humanity shape on first try. Why is this page not editable? The link for &apos;Lapp&apos; links to a broken page. Why even bother to write this page? How about including the fact that you have to face another poorly designed area with unkillable enemies that can see you no matter where you are? Was there any hint to this at all? "Show your humanity" is more of a red herring than a help to this puzzle. I gave it a genuine shot for 30 minutes, dropping embers in front of the wall (this game&apos;s equivalent to humanity), using embers, even going back to the fire keeper and turning back to human from hollow and nothing. How was I supposed to know I had to go down to the swamp, stand in water, cast chameleon until I randomly get a humanity lookalike and run back to the wall, especially as a melee character? I don&apos;t blame anyone for looking up the answer to this.